Bolivian coca growers despise Mother Nature! Chapare is the stronghold where evo came to power over 20 years ago, for the last 13 years, he has managed to get absolute control of ALL State powers and deforestation and environmental damage has not only seized both Yungas and Chapare, but has placed in serious jeopardy National Parks like Carrasco, Madidi, TIPNIS, and other pristine regions. 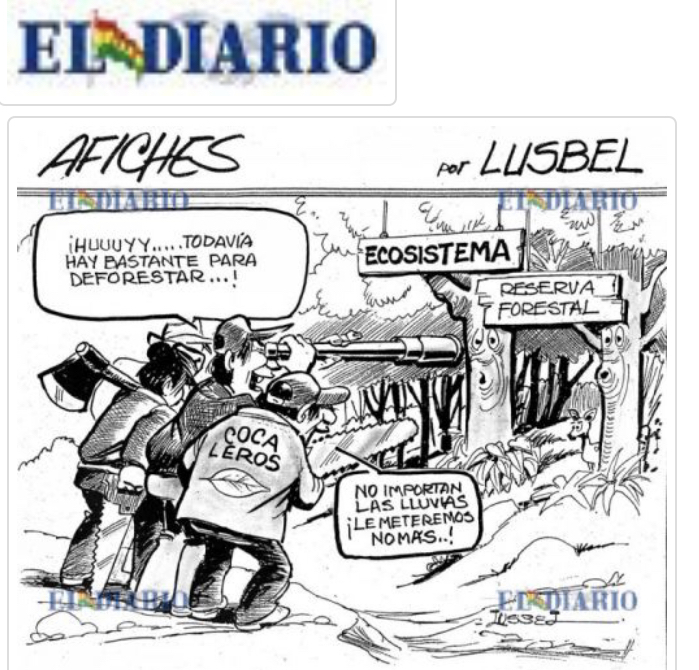 This cartoon from El Diario portrays this clearly and we must stop evo from destroying not only our environment but countless human lives who fall under the cocaine influence! evo must finish his term and leave office to face the numerous trials against him and acolytes for their incompetence and corrupt government. This entry was posted in Bolivia, Cochabamba, Crime and Violence, Drug war - narcotraffick, Environment, Politics, Social Unrest, TIPNIS and tagged cocaine production, corruption in public office, demagogue, government failures, narcotraffick. Bookmark the permalink.